Is it just me or, is that Kogasa’s hair on Kyouko? YES!!! The new Touhou character. awesome. :3 glad to see you updating again, Kirby. even if only to add new characters. also, lol at someone else leaving a comment with Conan in their name. It is Great to see a new Update for the New Characters. I thought it was the Madoka one. yay updates and also yay new characters, if your dowing new work would it be too much to ask if you could do sakuya’s outfit from the touhouvania gamehttp://danbooru.donmai.us/post/show/840203/banpai_akira-character_sheet-concept_art-formal-iz, if not I understand. Mark this under the “That was fast” file. Just noticed… there’s no “Spirit” object! Thanks for the update man! Good, now try to make Yoshika, the hopping zombie and bottomless eater that rivals Yuyuko. Are you actually in a position where you’re prepared to take requests, or is this just gonna be a two-shot deal until the full game comes out? OMG, that was fast & unexpected hurray! Can I request for a Kyubey as object? Also, here is a new Touhou Nekokayou. 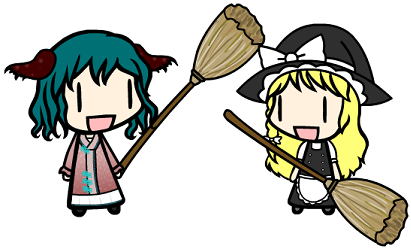 Hey, look, Marisa has someone to share her love of brooms. She no longer has to go on being unpaired with anyone. Also, great job and thanks for taking the time to get an update ready so quickly. Lastly, if you are taking requests, can you add Kanako’s new hairstyle from the second Wild and Horned Hermit chapter? Do we have an eta on Yoshika? I don’t want to sound impatient or anything, but I came up with a little skit thing and sooner it gets posted, the more people’ll see it. Probably next Friday/Saturday, like all the other Create.swf updates. Some time next week, yep. I don’t think I’ll be doing requests for things though. ok I understand sorry for bothering you, still looking forward to the other new girl though I find her far more interesting a character than kyouko. also, as it turns out. there are some magna characters that may need to be added.